Authored by David Lillesand, Esq. Reviewed by Patricia Keyes, Esq. 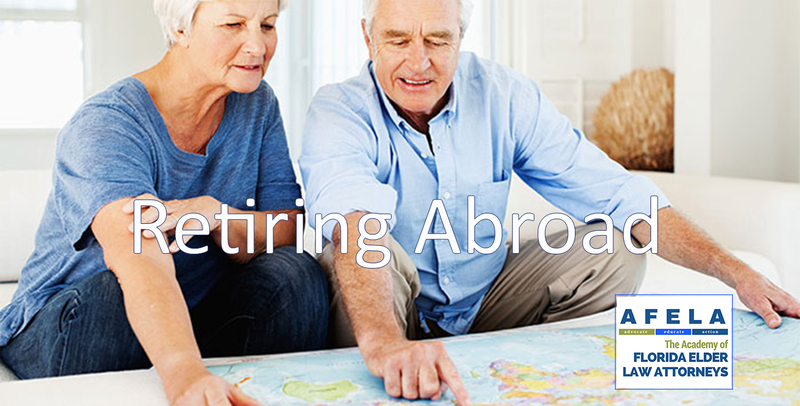 Are you considering retiring abroad? Below are some important issues to consider. First issue – if you are receiving SSI elderly or SSI disability, and you are outside the country for 30 days or more, you lose the benefits. There are a number of people who choose to live their retirement years in places outside of the United States. Perhaps retirement in Thailand or Portugal is in your plans. Maybe you plan to split your year between Central Europe and Central Asia. In many cases, it’s still possible to receive your retirement benefits while living abroad. SSA’s website – www.socialsecurity.gov – can help you navigate your benefit eligibility while living overseas. If you’ve worked in both the United States and another country, it may be possible for your credits to combine for a larger benefit. Currently, there are 25 countries with such international agreements with the United States. To find out if you have qualifying work in a country with such an agreement, visit www.socialsecurity.gov/international. [These agreements are called totalization agreements, and affect clients who work in Canada for many years, then come to the U.S. and work here for many years. Totalization agreements have mutual offsets so that the person gets as much as they would if they worked the whole time in one country]. You can receive benefits in many countries. To find out whether you can receive your benefits in the country where you are retiring, you should use our Payments Abroad Screening Tool at www.socialsecurity.gov/international/payments_outsideUS_page10.html. There are easy ways to get in touch with SSA and report changes to Social Security if you live overseas. You can contact your local U.S. embassy, write to us by mail, or call us at 1-800-772-1213. You can find other information in regards to living overseas at www.socialsecurity.gov/foreign. Although someone leaving the States may not be able to use their Medicare abroad, most countries have universal health care, like Costa Rica – a favorite destination for some of my former friends – and it is usually free or a small charge to buy into the system. My wife is British, so I checked out Britain’s universal health care for myself if we retire there, and it would cost me $224 per month for full coverage, no copays or deductibles. When my daughter lived in the Netherlands, she “bought in” to their free health care system for a one-time payment of $800. When my family traveled in Germany, and my wife ended up in two hospitals and getting some equipment, I asked where to pay, and they laughed at me – the two ER visits and the equipment was free. Both German doctors were educated in Boston, but we used them anyway.